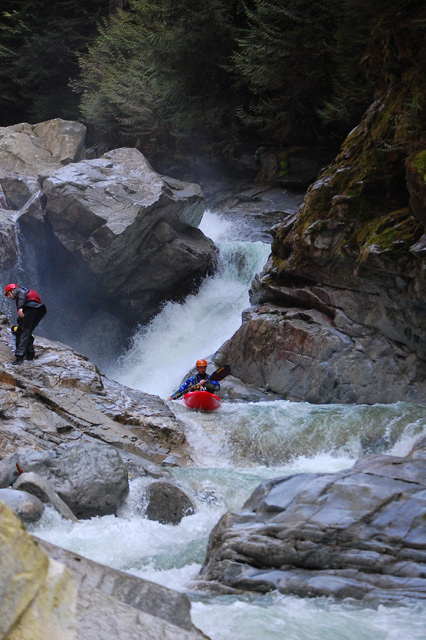 What It's Like: Steep, manky boulder rapids, a good bedrock canyon and some enormous waterfalls at the take out. 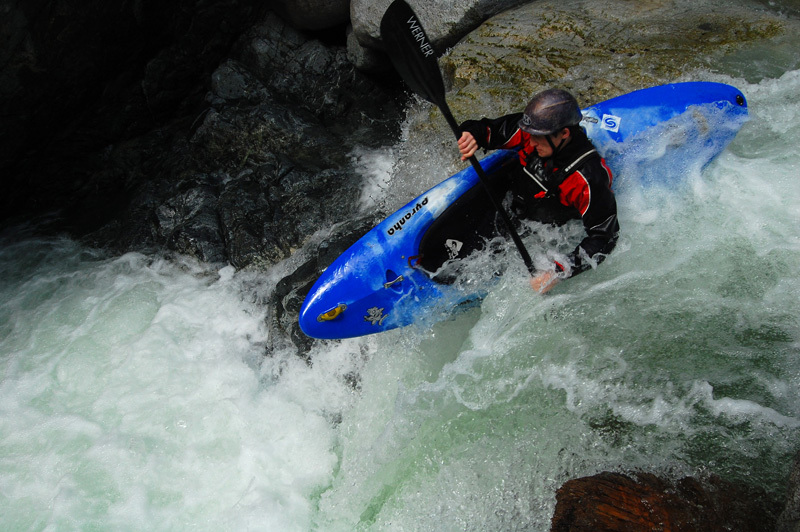 When To Go: After rain or early season snowmelt. Map: Click here for a map of the river and here for a map to the take out. 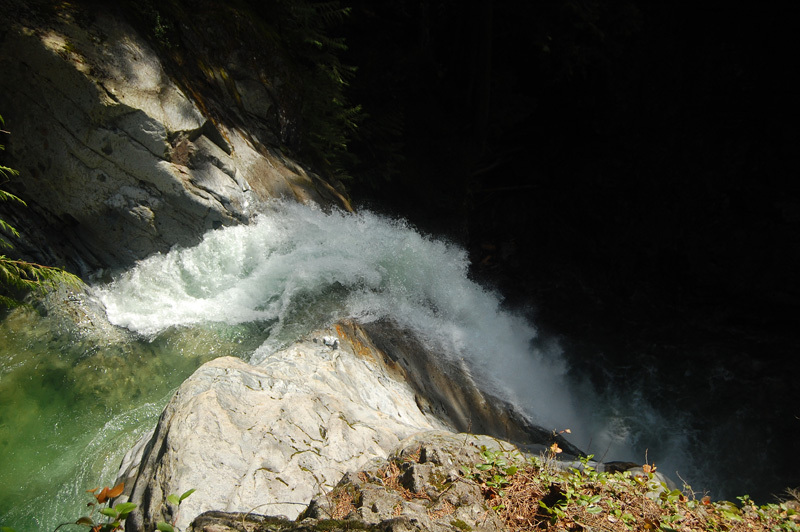 Cascade Creek is a relatively unknown run in the Fraser Valley, almost a sister stream to Norrish Creek, the next drainage to the east. 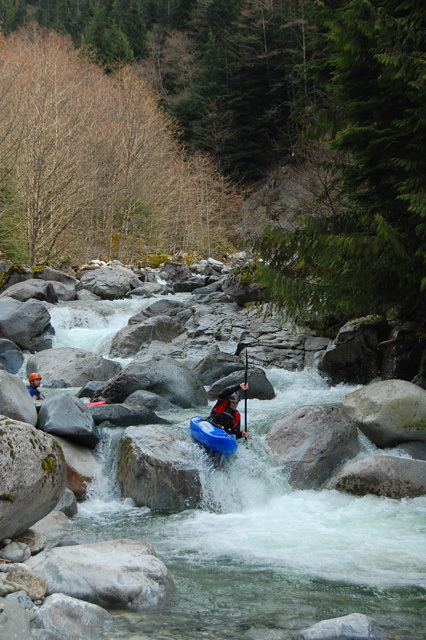 The lower section of the river is gravel and almost dry looking where you drive over it on the road, but looks can be deceiving as the upper reaches of this run form a bedrock canyon with some superbly clean slides and waterfalls sandwiched between sections of terrible mank. Below the canyon is a short, manky boulder slalom leading to a series of enormous waterfalls (100 footer and a 60 foot double drop) situated in a picturesque local park - it's strange that this run is not well known. 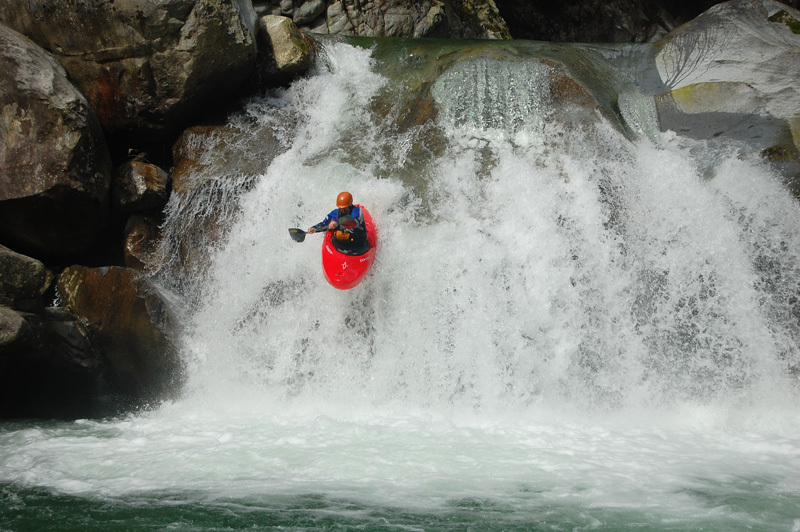 Take the (V+) rating in the Vitals above with a grain of salt - this only applies to the big waterfalls - for most kayakers this river will be a very manageable class IV-V river - boating the big ones is a mission in itself. They have both been run. 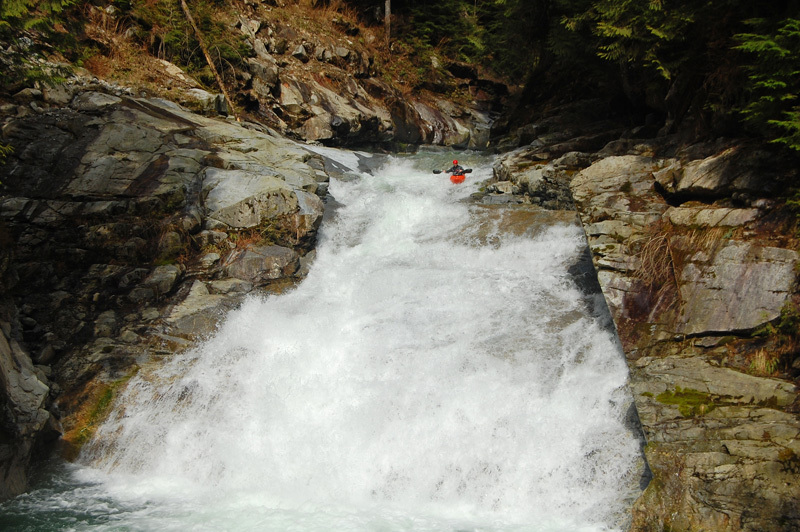 Hitting a good flow on the Cascade is difficult. Like all runs in the area, it will get too high during periods of heavy rain. That being said, the river drains a small low elevation zone so it doesn't have a big snowmelt season and it flashes quickly after rain. We recommend going after moderate rain, or after the first blast of warm weather early in the spring. If the rapids directly above the waterfalls look manky but passable, the rest of the river should be ok. This river is easy to find. Go to Mission and then head east out of town on highway 7, north of the Fraser River. 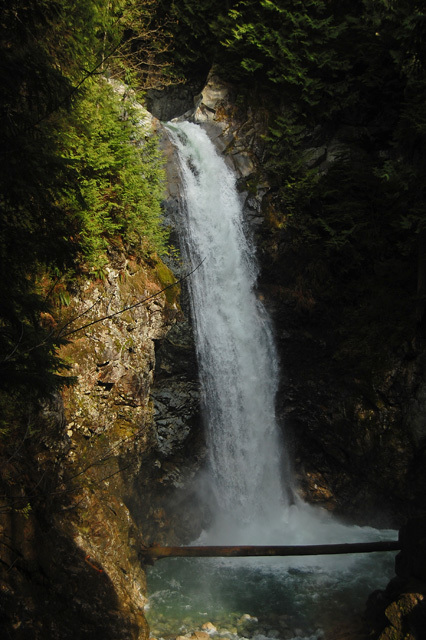 Check out the map above for directions, and as you leave town you'll see signs leading the way to Cascade Falls Park. 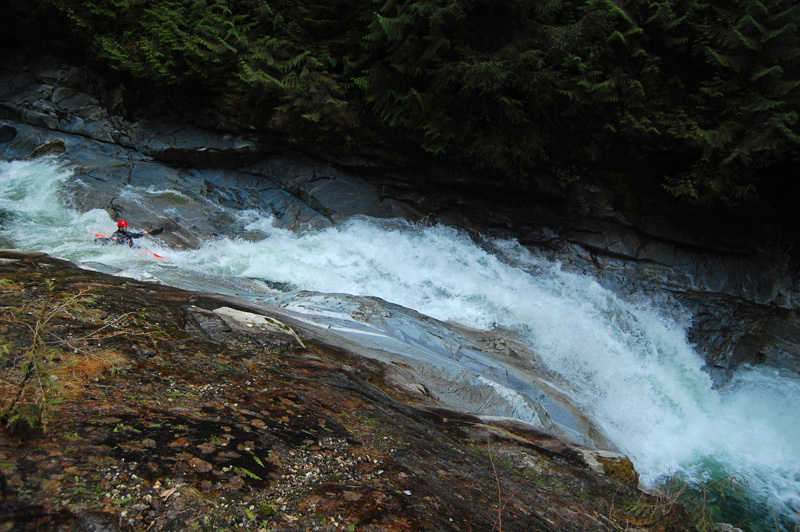 Take a left turn at Sylvester Road and drive for approximately 11 km to Cascade Falls Park at the bottom of the river. Unfortunately this one is a hike in trip. While there is a road that heads up the valley, it is gated and it's unclear when or if it is ever opened. From the parking lot it's a quick walk up to check out the huge set of waterfalls at the end of the run - you can't miss them. You may want to hike up above the two drops to make sure you know where to stop boating (there are excellent trails all over the place here), although it's hard to miss the big horizon line from above. 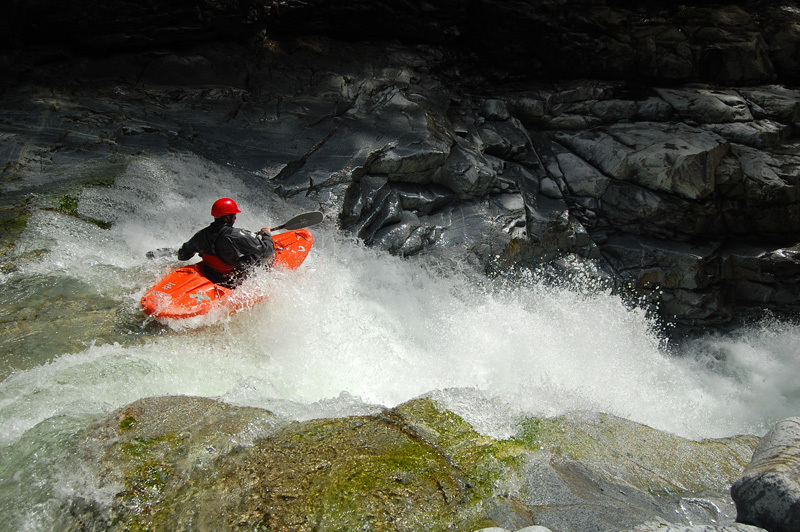 This will also give you a chance to check out the flow in the river. The hike to the put in is all uphill. If you go far enough, the river will come right up to the road without any downhill hiking at all. Following the road from the parking lot will bring you under and along some power lines. If the road forks, stay right - the trail will start to drop away from the power cut and the river will get closer and closer. This trail ends where an old cable car crosses the water; the upper put in. 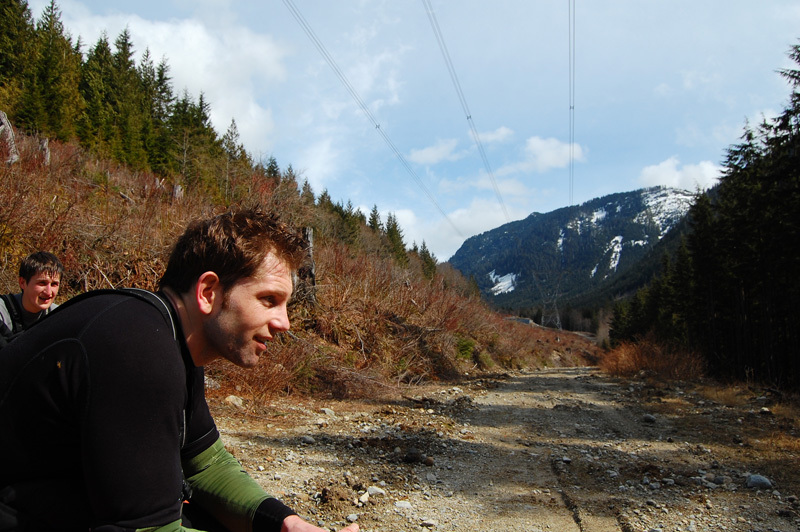 Alternatively (recommended) you can hike in to where the river gets good by cutting down to the river where there is a big steel retaining wall under the power lines - this is the option that eliminates most of the terrible mank at the start. 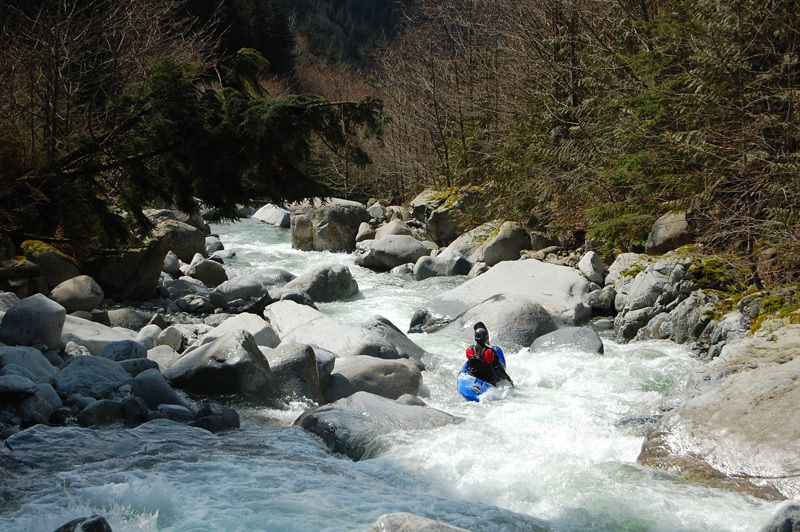 From the upper put in there are very low volume, terribly manky boulder rapids. 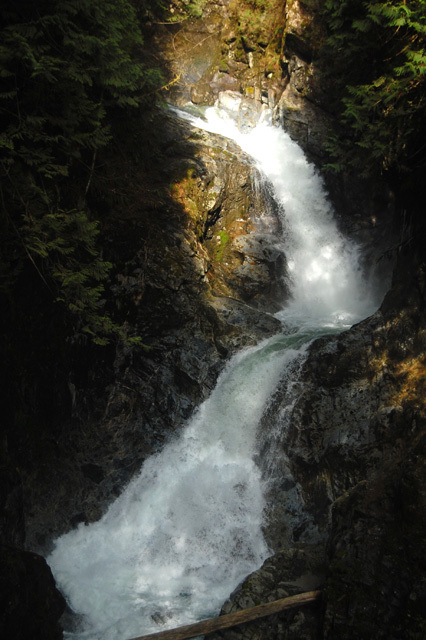 A tributary entering from the left doubles the flow and marks the start of the canyon (this is where the lower put in drops you to the river). 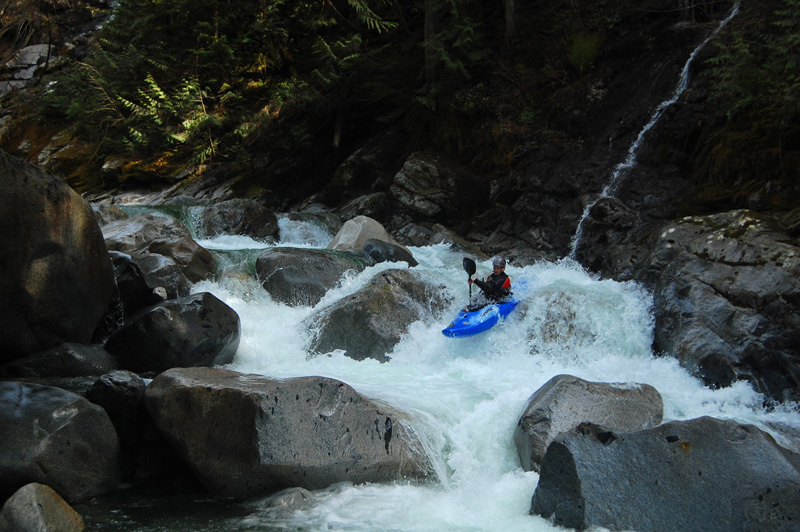 After the canyon starts the action comes quick with a bunch of boulder rapids that slowly morph into bedrock. The first major scout is obvious - what you'll find is an amazing slide to boof/sliding waterfall double drop - there is a cave at the bottom of the second drop. 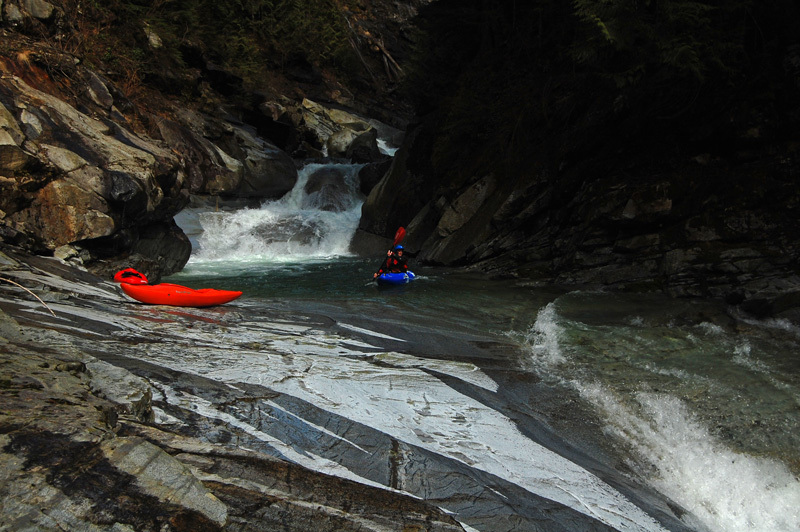 Some smaller, tricky to scout rapids in the canyon will then take you around a left-hand bend in the river to a great set of three slides. Below the third slide are one or two more ledges, after which the canyon ends with a very clean waterfall. Charge the mank after the canyon down to the obvious horizon line above the huge waterfalls at the end of the river. 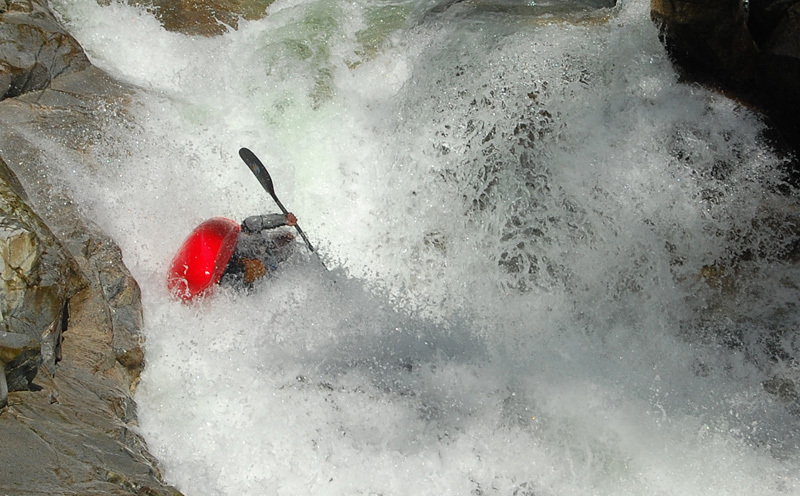 Some of the rapids in here have fun lines. Fire up the big ones if you like - they are stout! Have fun getting in there and checking out the Cascade. Taking a break on the hike in. The first rapid of the day after the cable car put in. This is what most of the upper river is like. Use the lower put in. 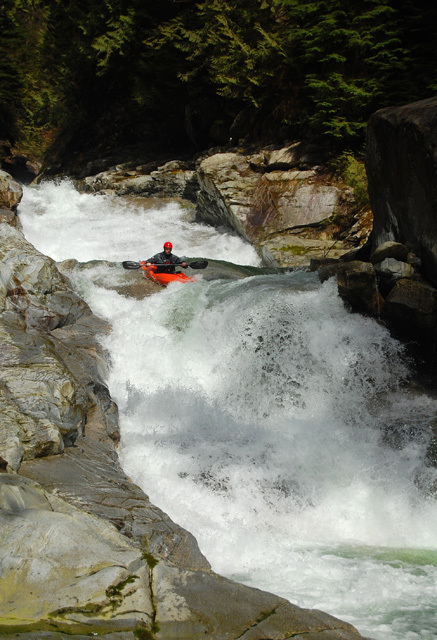 One of the only good rapids above the canyon. The first decent boof of the run - Matt Kompass dropping in. 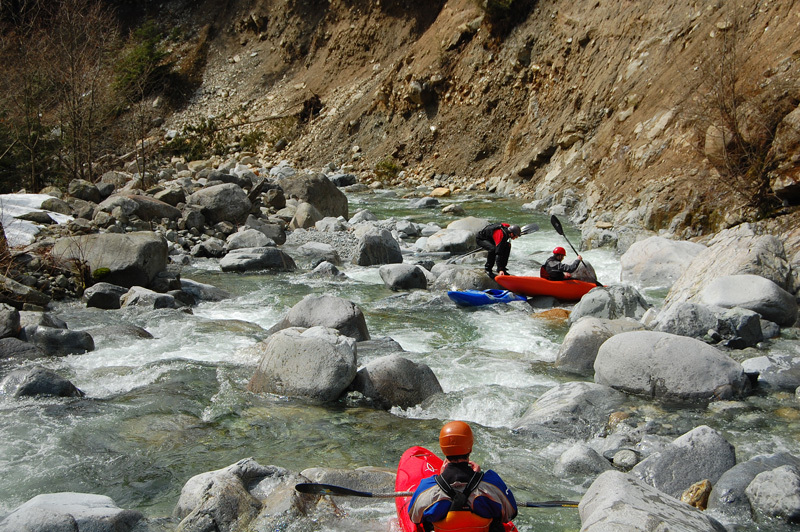 One of the entry boulder rapids in the canyon. Kyle Dunn probes the first half of the double drop. All smiles in the run out of the double drop. Getting ready for the big slide. The burly third slide, probably the crux of the run. The lip of the big one. The double drop immediately below the big one.